Picture this; it’s a hot and dusty morning. You wake up, still hangover from last night’s lake party. You checked the garage and you see your Prius, trashed and caked in mud. What will you do? Will you drive town to bring your ride to your trusty carwash shop? Or will you take the time to do a traditional cleaning in your garage on a hot day? Why not add this to your option: You do a not-so-regular carwash using a car cleaning tool. Car steam cleaners have been around for quite some time now. This method of car care adopts the efficiency of traditional garage carwash and the convenience of going to a carwash facility. Efficiency-wise, steam cleaning claims to be versatile and car-safe. While traditional carwash uses various car waxes, soaps and rubbing compounds, a car steam tool only uses water and steam to flush out dirt and other smears on your vehicle. Doing regular driveway carwash can be a bit tricky and exhausting, not to mention time-consuming. Meanwhile, Going to the carwash means extra expenses, and you can forget about your fantasies of going to a bikini carwash. Steam car cleaning on the other hand, somehow consolidates both (leave the bikini part behind). And because it does not use any harsh chemical-based cleaning agents, your paint job is as sure as safe from getting unwanted damages. The steam coming from the device’s steam jet acts as the cleaning agent, using the pressured moisture to wash out grime, mud, asphalt residue, dust and water marks. Conserve water. 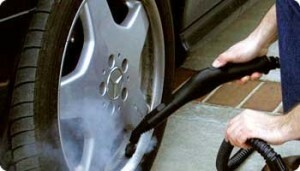 Use a car steam cleaner. Just like steam tool and other handheld mop, car steam cleaners are widely-known to be environment-friendly as they use water only. Most car cleaning mop water reservoirs consume about 3 gallons to cover the entire wash, as opposed to regular garage carwash and carwash facilities, which requires roughly 30 to 50 and 80 to 100 gallons of water respectively. Car steam cleaners are designed to cover all your car cleaning needs, INSIDE AND OUT. They are usually equippedwith a long hose and various attachmentsto cover your car cleaning needs, be it spills on the car’s interior upholstery (dashboard, carpet, leather seats, etc. ), exterior, mud guards and even for engine wash to bust out excess grease, and oil leaks from hard to reach areas. Face it: old school carwash takes forever, so you can just forget about it. Meanwhile, carwash facilities take about 20 to 30 minutes to finish the job. That includes driving around town and waiting in line for your car’s turn to get washed. With a car steam mop, it usually runs for only about 15 minutes right in the comfort of your own driveway. A simple blast of steam and a clean cloth to wipe it dry are all you need! Of course, results may vary based on the features, accessories and usage. It is best to know first what caters most to your car care needs before deciding to get one. 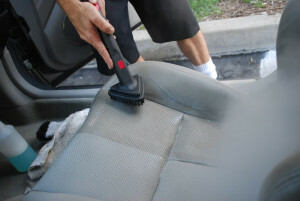 Check this car cleaning tips for your carpeting and upholstery.